Learning how to play a game of Texas Hold’em can seem much more difficult than it really is. The game itself is actually very logical and simple and requires just a few minutes to learn. Mastering it, however, will take you a bit longer. Let´s go step by step. When playing Texas HoldEm poker, every player is dealt two cards face down – these are called your ‘hole cards’. Then there is a round of betting where you can Check, Bet or Fold. We will talk about betting later on. This stage of the game is known as pre-flop and what you should do is dependent on those hole cards, or starting hand. When all the betting has finished three shared cards are dealt face up in the middle of the table. This is called the flop. 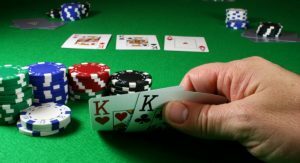 Your best Texas Holdem hands will be made by using your hole cards and the five cards in the middle to make the best possible five card poker hand. So, for example, if you have 9-9 and the shared cards are 9-9-A-5-2 you have four-of-a-kind. If the shared cards were J-Q-K-7-2 you would only have two nines. Sometimes the best texas hold em hand is made by the five shared cards on their own. If they were 10-10-10-10-A and you had 9-9 your hole cards would not play as there is a four-of-a-kind of higher value already showing. There are two ways a hand can end. One is when the players in a hand turn over their hole cards and the player with the best hand wins. This is known as a showdown. The other is that someone will bet enough that everyone else folds. This is how most hands end in Texas Hold’em and that’s the magic of the game – you don’t always need the best hand to win. When you raise, you first bet enough to match what has been bet since the last time you bet (as in calling), then you ‘raise’ the bet another amount (up to you, but there is typically a limit.) Continuing the above example, if you had bet a dime, the other person raised you fifteen cents (up to a quarter), you might raise a quarter (up to fifty cents). Since you owed the pot 15 cents for calling and 25 for your raise, you would put 40 cents into the pot. When you fold, you drop out of the current hand (losing any possibility of winning the pot), but you don’t have to put any money into the pot. The ranking of Poker hands is based on mathematics. The less likely a player is to get a certain hand, the higher it ranks and the more likely it is to win the pot. For example, a player should not expect to be dealt a straight flush more than once in 65,000 hands, but he can expect to be dealt two pair about once in every 21 hands. Unless a player is planning to bluff, he should not make a bet without holding a hand that he thinks may be the best. No Poker player can bet intelligently unless he knows what constitutes a good hand, a fair hand, and a bad hand. A table of the various Poker hands and the number of combinations of each in a pack of cards is provided. A player may reload, or add more chips to their stack, at any time between hands. Once a hand is started, a player may only use the chips they had in play at the beginning of the hand, during that hand. Any additional chips will not be “in play” until the next deal. Okay, let’s go over how a Texas Holdem poker hand works using only poker slang and see if you can keep up. Firstly, you are dealt your hole cards. Then there is a round of betting. Then the players remaining see a flop. Then there is another round of betting. Then you see a turn card. Then another round of betting. Then a final river card. Then one more round of betting. The best five card hand wins. Clear? Excellent.